Above: An outline map of Inner London detailing the places mentioned in this article. Inner London is, in general, a continuous land mass. Running through it – on an approximate east-west axis – is the River Thames which also has smaller tributaries flowing into it. At first glance on a map, there are no islands to be seen. That does not mean that parts of Inner London have not been regarded as islands over the last 2,000 years of its history. When talking about an island, it is usual to assume that the land is entirely surrounded by water, usually the sea – like the Isle of Wight or Anglesey. When considering Inner London that is not always the case. We need to consider the origins of the words ‘island’ and ‘isle’. The first two letters of both words – ‘is’ – are pronounced as if the spelling was like the word ‘eye’ which is actually derived from Old English and Old Norse roots. Spelt ‘eg’ or ‘ey’ it was also pronounced as if it was the word ‘eye’. All this means that today’s word ‘island’ derives from ‘ey’ and ‘land’. In fact, it could be interpreted as ‘land surrounded by water’. Today’s London Borough of Hammersmith and Fulham has a good example which illustrates the usage of the word ‘ey’. It is a small elongated island on the Thames near Hammersmith called ‘Chiswick Eyot’. The ‘ey’ in the second word derives directly from Old English. In addition to pieces of land actually surrounded by water, there were also areas of land that carried the meaning of ‘dry land within an extensive marsh’. Within a marsh there can be (1) an area of raised land which, because it was drier land than the rest of the marsh, was able to be inhabited or (2) an area of gravel within marshy land that may not have been raised but, due to the gravel, was stable enough to carry the weight of a large building. There are several examples in Inner London. In the London Borough of Westminster – more accurately known as the City of Westminster, for historical reasons – is the well-known Westminster Abbey. The first church built on the site is believed to date from Saxon times. It was erected on an area of gravel known as ‘Thorney Island’ a name meaning ‘Isle of Thorns’ – probably due to thorny plants growing there, like gorse. 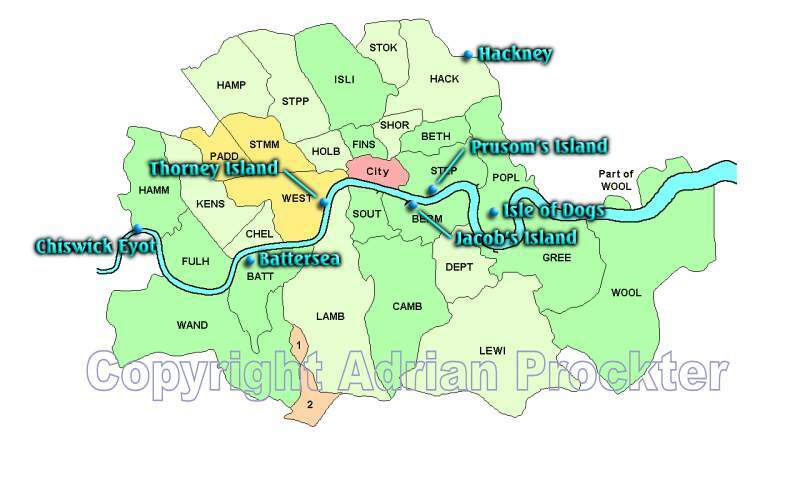 In the London Borough of Hackney is the place name Hackney (which may mean ‘Hacca’s Island’). This may actually have been an island of land surrounded by water, probably near the River Lea. Its exact position is not known but it was some distance inland from the Thames, situated on the marshy land where the River Lea is situated. Even today there are the nearby Hackney Marshes. Today’s London Borough of Tower Hamlets has two names that relate to the island theme. The so-called Isle of Dogs is not actually an island but a peninsula. It has water on the west, south and east sides due to the Thames. On the north side, it is connected to the land mass of Poplar. In earlier times it was known as Stepney Marsh and the origins of its present name are by no means certain. The Isle of Dogs was once all marshy land with no stable area of gravel to be found anywhere on it. A short distance west, in Wapping, is the curious name of ‘Prusom’s Island’ which appears on old maps but has disappeared from the modern street map. There is a ‘Prusom Street’ which was on the northern extremity of the land. This was almost certainly raised ground surrounded by marsh. Within today’s London Borough of Wandsworth is the place name Battersea (meaning ‘Patrick’s Island’). The last syllable of Battersea would sound the same if had ‘ey’ on the end of the name and it relates to an area of gravel near the Thames on which the original settlement called Battersea developed. This settlement was around the old parish church of St Mary. Although it only had water on the northern side, due to the Thames, the marshes to the south and east were probably just as treacherous as water would have been. In today’s London Borough of Southwark is the place name of Bermondsey (meaning ‘Beomund’s Island’). The exact piece of land from Saxon times to which Bermondsey refers is uncertain. One of the earliest uses of the place name applied to where the large stone-built Bermondsey Abbey once stood and it is known that its site was on an extensive area of gravel. A short distance to the north is the inlet now called St Saviour’s Dock. On the east side of that inlet was a piece of land that was once completely surrounded by water – Jacob’s Island. The name arose due to the marshy conditions and the man-made ditches that were created to try to drain the land. As a footnote to these place-names, it should be pointed out that while building on an area of gravel would not guarantee that those living there did not get flooded in times of high tides, gravel is very stable. Since much of London beside the Thames was once almost all marsh, those who wanted stable land on which to build sought out the places with gravel on which to form a settlement. In case you are now starting to think laterally about Inner London, there are two other place names that deserve a mention. They might sound as if they should be included in this article but, in fact, they have nothing to do with the subject. Firstly is Chelsea, in the London Borough of Kensington and Chelsea. The last syllable of the name may sound as if it could have been ‘ey’ but that is not so. The name Chelsea is taken to mean ‘a landing place for chalk’. Secondly, the Outer London Borough of Bexley has a village called Bexley, some distance east of Woolwich. The name Bexley is derived from two Old English words – ‘byxe’ (meaning a box tree) and ‘leah’ (meaning a grove of trees). The name, therefore, means ‘wood or grove of box trees’. This entry was posted in 4--Subject. Bookmark the permalink. I really liked this post, Adrian. I always look out to see old islands, river changes or ‘canals’. Whilst many rivers are easy to find or at least see where they once flowed due to the dips and valleys even in London, the islands have usually proved beyond me.